This article was first published in The Times on 11 January 2014. On a Saturday night in a dark square in Soho young men and women are asking passers-by if they would like to light a candle in a church. They hold lanterns and look smiley and enthusiastic. Most passers-by ignore them, or say no, politely or impolitely. If they say yes, they are taken into St Patrick’s, a Catholic church near the decadent heart of Soho, where a choir is singing in candlelight. Here they can light their own candle, read a piece of scripture, or just sit and enjoy the calm. By the end of the night 360 candles have been lit. 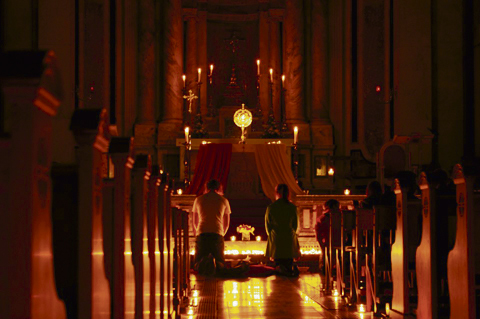 The evening is called Nightfever. Two Germans came up with the idea in 2005, and it has since spread all over the world. In the past few months it has started in Glasgow, Oxford and Gosport in Hampshire. One of the organisers in Soho says he was cynical when he heard about the concept at first. “I thought, what’s the point? People light a candle and then go out.” But actually, he says, people are often deeply touched. They say they will come in just for a minute and end up staying for an hour. One man even gave him a hug. When I sit in the church a steady stream of people come through the door — students in bobble hats, women in stilettos, shoppers weighed down with bags. The atmosphere is as soothing for atheists as it is for believers. The men and women taking part, mainly in their twenties, also seem to enjoy it. “It gets addictive,” says one girl. “You can have very real conversations very quickly.” She says “it’s not too far to say that [it can be] life-transforming”. It is no surprise that the project was started first at St Patrick’s. The parish, run by Father Alexander Sherbrooke, is seen as one of the most dynamic in London. Among its activities, its soup kitchen feeds 80 or so homeless people twice a week. It also runs a prayer group for addicts and a year-long residential course about the Catholic faith. I arranged to meet Father Sherbrooke, a tall, imposing man with a slight stoop and bushy eyebrows, a few weeks earlier. He is a little gruff and, as he opens the door, demands to know why I am so early. We talk over tea and Mini Snickers bars, which he eats distractedly while explaining theology.